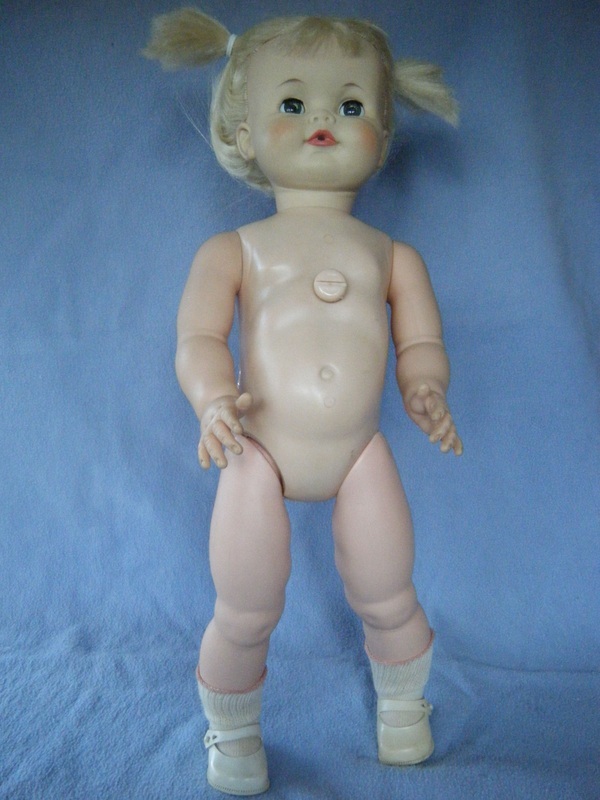 Chatterbox is a Madame Alexander doll that was only manufactured in 1961. She is 24" tall. Her head is vinyl with rooted hair. The body and limbs are hard plastic. She originally sold for about $18 and was available from Sears. My sister acquired Chatterbox in January 2012 at an antique store. She was dressed in a real baby outfit. The outfit is not shown. We believe the socks and shoes to be original (see Figures 1 & 2). What makes Chatterbox interesting is that she has a battery powered phonograph in her body cavity. My sister purchased a copy of Chatterbox's operating instructions on e-Bay. The following excerpt indicates that Chatterbox was intended to have interchangeable records, which is in agreement with the information in the patent. "The mechanism of Chatterbox has been carefully inspected and found to be free of all defects. By following the instruction sheets, it is waranteed to last one year, if properly cared for. Records and batteries are replaceable and can be purchased at your dealer." I like to ride on the carousel. Who is coming to our tea party? I hope we have cookies. May I wear my new dress? Could we go shopping soon? It woud be fun to take kitty along. I believe, that with a little restoration work, Chatterbox will be able to say a few of her phrases (assuming that the scratches in the record are not too severe). If I can encourage her to speak, I will record the phrases and post them. It is interesting to note that there is a discrepancy between the information contained in the patents and what is listed in references. The references claim that the doll talks when the button in her chest is pushed (see Figure 1). The patent states that the button is used to disengage the record from the stylus allowing the stylus to reset it to its starting position so that the spoken phrases can be repeated. Further into the patent, a second function of the button is described and illustrated. A band is strapped around Chatterbox's chest and passes over the groove in the button during shipping. The strap keeps the button depressed, releasing the stylus from contact with the record - thereby preventing damage to the record through the potentially rough handling during shipping. 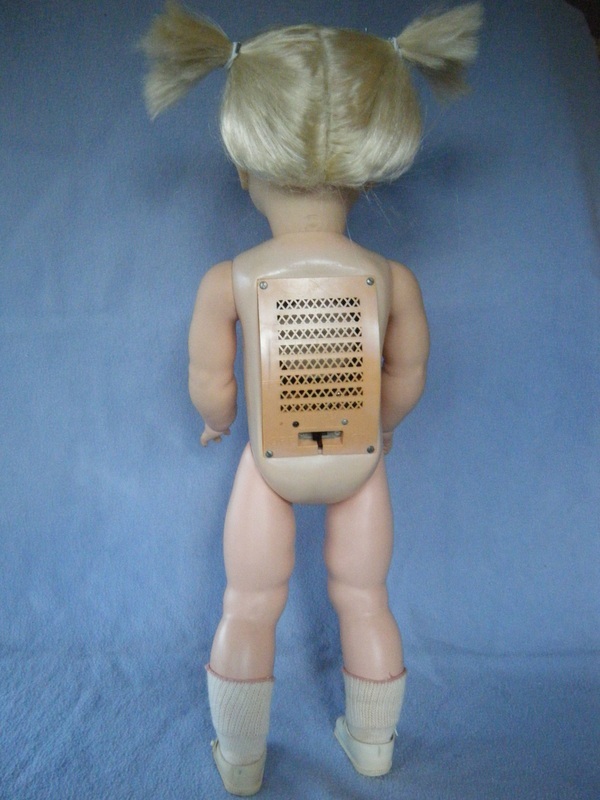 Figure 1 - Notice the "talk" button in the upper torso. Figure 3 - Chatterbox's face shows her Madame Alexander heritage. (Ignore the finger visible on the left side of the neck - we were holding the doll upright so her blue sleeper eyes would show). She is what is known as a "dry nurser"; the mouth accepts a bottle but the doll is not plumbed to be a drinker/wetter. Figure 5 - An interesting feature is that the saran hair is only rooted in certain parts of the head. The bald spots would be covered by hair when the pigtails were in place. Figure 2 - The "On" switch is at the bottom of the grill. Figure 4 - Notice the Alexander Doll Co. mark and 1961 date. 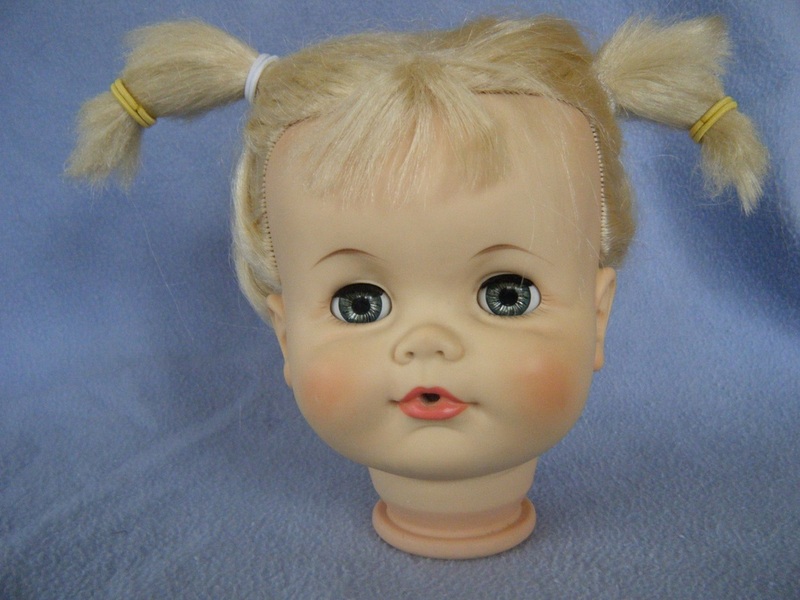 The patent was not granted until 1968 (long after the doll was out of production). There were actually two patents filed for the phonograph mechanism (US3239229 and US3403913 available in PDF format from the US Patent Office site or from Google Patents). The second patent makes 14 claims compared to the original's 5 claims. This suggests that talking dolls were a hot development in toys. Several later patents filed by Horsman and Kenner reference these patents. Figure 6 - Split where the leg joins the body. Figure 7 - Split in the seam between the legs. The splits in the body are due to changes in the hard plastic over time and not due to rough handling by the owner(s). The splits cannot be repaired by applying pressure and glue. The most noticeable problem with Chatterbox is the warped and cracked grill covering the phonograph cavity in her back (see Figure 8). This is speculation, but it appears that the hard plastic of the body has shrunk with age while the softer plastic grill has expanded with age. The phonograph is visible through the gap. According to the patents, the purpose of the grill is to allow the sound out of the body cavity. The gap at the base of the "ON/OFF" switch is by design and not a crack. The screws holding the "ON/OFF" switch in place are different by design (notice they are different colors). The screws are different lengths to avoid contacting the underlying mechanism. Figure 8 - The warped and cracked grill. A common problem in Chatterboxes listed on e-Bay. The black backing, visible in Figures 8 & 9, acts as a sounding board. The record has scratches. This could be due to rough play or to the sounding board being assembled incorrectly during manufacturing. The metal disc above the record is intended to keep the record flat as well as spread out the force of the user tightened nut when the record is changed. The brass piece on the right in Figure 10 is the contact for the batteries. It swings out of the way so that the two "C" batteries can be replaced. It is interesting to note that several sources incorrectly state that Chatterbox required four "D" batteries. 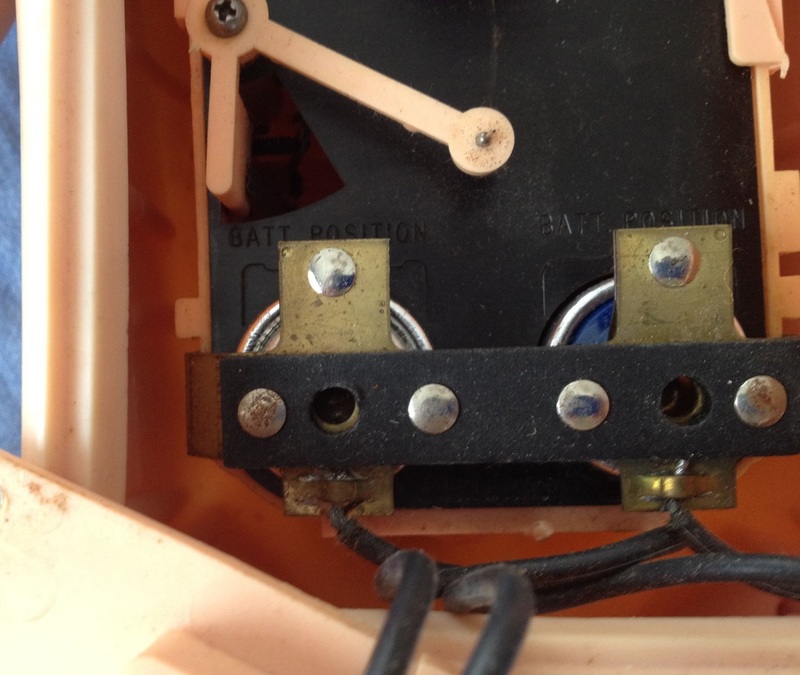 The batteries in this doll corroded the metal contacts and stained the battery compartment. They may be original (Figure 11). They are EVEREADY batteries with the black cat "9 lives" logo typical of the 1960's. The price on the batteries is 25 cents. Figure 8 - The pin holding the neck flange to the torso is visible inside the body cavity. Expanding the image reveals that the right side lip holding the black sounding board in place is cracked. 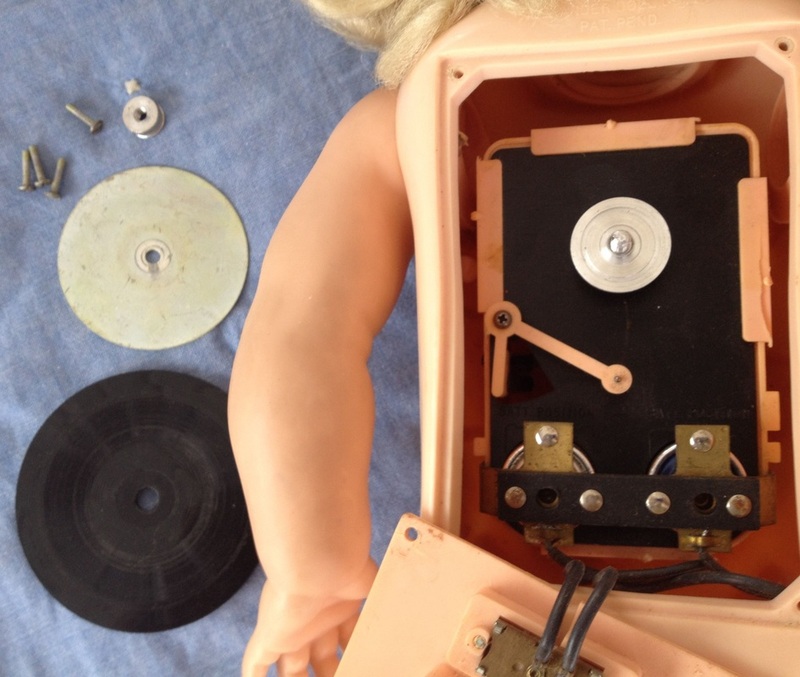 Figure 10 - This is a side view of the phonograph player once it is removed from the body cavity. Figure 9 - With the record removed, the stylus arm is visible. Figure 11 - The 25 cent EVEREADY batteries that corroded the battery compartment. In Figure 12, the stylus has worn an arc shaped groove into the black sounding board. The sounding board was either assembled wrong during manufacturing (as it is seated above the flange designed to hold it in place at the bottom of the battery area) or it was intentionally assembled that way as a design fix to force the stylus to make better contact with the sounding board. In any event this has caused a significant problem. The sounding board has become brittle with age and is falling apart from the stress of being "out of position". Hopefully the deterioration of the sounding board will not affect Chatterbox's "angelic" voice once her speech is restored. Here is another interesting tidbit and a caution based on researching the patents. First the tidbit. Chatterbox only talked when she was switched "ON" and held upright. If she was laid down while switched "ON" she would stop talking. This was to simulate a toddler going to sleep when laid down. When returned to the upright position, she would resume talking where she left off. Her series of spoken phrases could be restarted by pushing the button in her chest which lifted the record off of the stylus and allowed a spring to swing the stylus arm back to its home position. Now the caution. The ability to start and stop talking when tilted is possible because Chatterbox contains a mercury switch. The mercury switch is visible in Figure 13. It is the cylindrical object with the green center mounted at an angle (top center of the photo). Mercury is a heavy metal that is now known to affect the central nervous system. The mercury is sealed within the switch. The switch should not be dismantled! Mercury was used in the switch because of its unique property of being a liquid metal at room temperature. The drop of liquid Mercury could roll back and forth within the switch as the doll was tilted. Depending on the angle of the doll, the droplet would make or break electrical contact - allowing the motor to turn, or not turn, the record. Figure 12 - Close up of the battery holder and stylus. 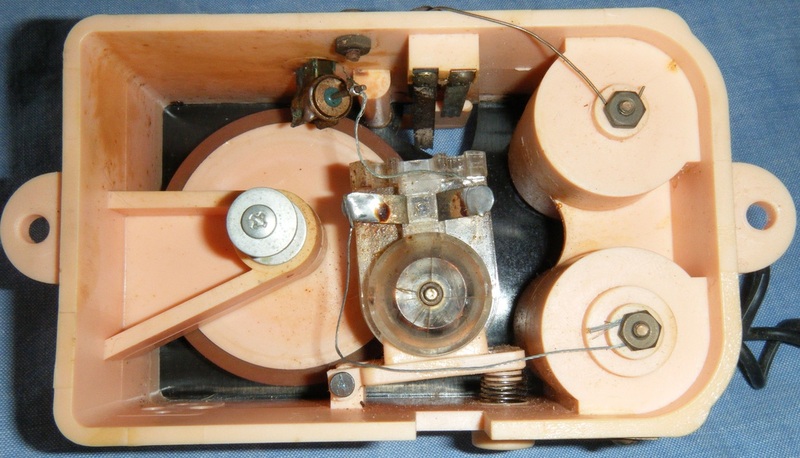 Figure 13 - The underside of the phonograph mechanism. The motor housing, just below photo center, shows signs of cracking. Several weeks passed before I was able to work on Chatterbox's phonograph system. The first step was to clean the contacts in the battery compartment. New batteries did not spin the turntable - the motor was frozen in position. I removed the motor by pulling out the nail acting as a hinge on the mounting. I placed a drop of clock oil at both ends of the motor shaft which allowed it to turn freely. I had to polish the nail to reset it back into the hinge. In the process of reinstalling the motor, the braided wire connecting the motor to the mercury switch broke. I had to unsolder the broken pieces and solder in a long, single strand of copper wire as a replacement. At this point the motor would spin freely with no load but would seize up when it made contact with the turntable (Chatterbox uses a direct drive system). I guessed that the turntable bearing needed lubrication as well and took it apart and added a drop of clock oil. This fixed the problems with the phonograph drive system. Once the record was replaced, it just skipped and made static noises. Inspection of the record showed it to be scratched and somewhat dirty. We wiped the surface with doll cleaner and reinstalled the record. Chatterbox would speak her first phrase (not very clearly) and then freeze. The phonograph arm wasn't moving because the base of the needle was catching in the groove worn in the black sound board. I removed the arm and burnished the rust from the dragging end of the stylus. I also burnished the groove worn in the sound board. While the arm was out, I took the opportunity to lubricate its pivot. I also polished up the needle and shaped the tip according to the instructions in "Talk to Me!" by Ben Truwe (available from Talky Tina Press). I reassembled the arm and tried to get her to speak again. She started up and ran through her entire list of phrases with some sticking between the first and second phrases! After a few run throughs her voice became clearer. Below, is an MP3 recording I made using Garage Band and the mic in my MacBook. It was really exciting to hear Chatterbox talk again after 50 years of silence. It is successes like this that make doll repair a rewarding hobby. Figure 14 - Reassembled and ready to try speaking again. Figure - The warped speaker grill was not altered during the restoration process. Figure 16 - Clean face, hair, and temporary do. Info obtained: open mouth/dry nurser, plastic body and legs with vinyl arms and head. Rooted white hair. Blue sleep eyes/lashes. Open hands with thumbs up. Push button in center of stomach makes her talk. Battery operated with changeable records. Marks Mme/1961/Alexander on head.